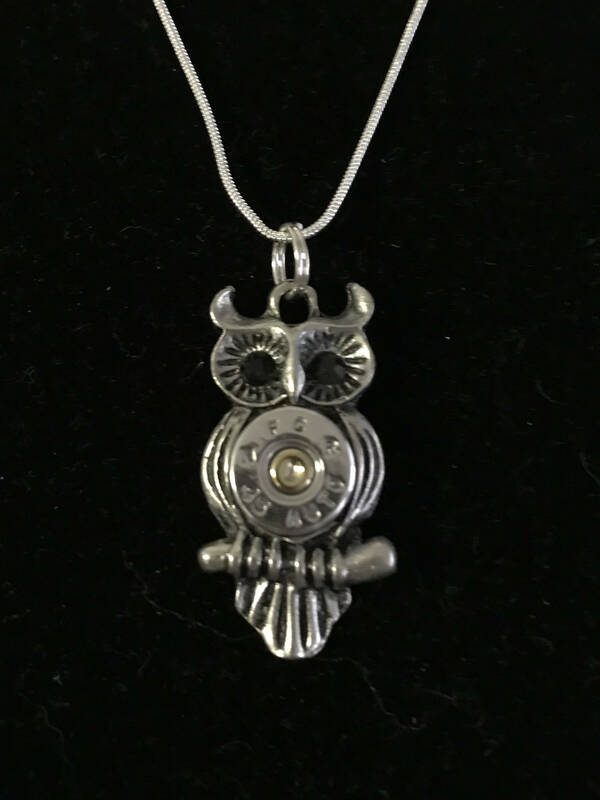 This owl necklace is such a hoot! Made with the real 45 bullet casing as the belly and black eyes, it hangs on an 18 inch silver plated chain. A crystal can be added to the primer in the center of the bullet belly if desired by sending a note to seller of the color crystal desired. Paper & bow/ribbon color can occasionally be adjusted according to holiday. Please note if birthday, Christmas, wedding/shower gift, graduation etc. Beautifully crafted money clip. This was the second purchase as a gift. The men in my life love it. I recently lost my father. With the shells from his 21 gun salute, I had my mother, daughter and I these anchor necklaces as he was in the Navy, made by Michelle. We couldn’t have been more pleased. We get so many compliments on them. Great quality, made by someone who loves her job! Payments can be made using major credit cards or Etsy gift cards. Cancellations on stock items are accepted up until the item is prepared for shipping - which may be earlier than the date listed on Etsy! Cancellations on custom orders are not accepted once pieces to create the item have been acquired or work has been started. State sales tax will automatically be added to South Carolina addresses. I want you to be positively FIRED UP about your purchase! If there is a problem on your order, please contact me promptly to allow me the opportunity to be aware of the issue and make it right. No refunds on custom orders after work has begun or materials have been acquired to create the custom order. Most items will be shipped in 1-3 business days. Items are sent USPS First Class Mail which includes tracking. We are not responsible for lost, delayed, damaged or stolen goods due to the US Postal System. Custom orders welcome! Please contact me if you would like something special created or if you desire a particular brand/color/gauge. Also, I am willing to create a piece using your special casing that you mail to me. This gives you a great way to create a Memento from your special occasion such as a first deer, first turkey, or as a memory using the casings from a 21 gun salute of a loved one etc. Please convo me to discuss. When ordering please be sure to include all information needed to complete your order in the "Notes To Seller" section. Lack of providing necessary information may result in delayed processing time. Thank you for understanding!